1. In a large bowl, mix together chocolate cake batter, with 1/4 water, 1/4 cup oil, and 2 eggs. Beat for 2 minutes. For the strawberry batter, mix together the vanilla cake mix, strawberry puree (just mash or blend fresh strawberries), 1/4 cup of water, 1/4 cup of oil, and 2 eggs. Blend for 2 minutes. 2. Using an ice cream scoop, spoon each flavor batter onto a cook sheet lined with parchment paper. Be sure to leave plenty of space in between. The batter will nearly double in size! 3. Bake at 350˚ for about 10-12 minutes of until firm. Make sure not to under cook them or they will become sticky and hard to handle. 4. Remove from oven and let cool for about 10-15 minutes. 5. While whoopie pies are cooling, fill your piping bag using a large star tip, with marshmallow fluff. 6. When the pies are cooled, take on into your hand, flat side up, and pipe marshmallow fluff around the edge and then fill in the center. Top your pie with the opposite flavor and you're done! 7. Store remaining cake mix for another batch, or double the recipe if you're feeding a crowd. 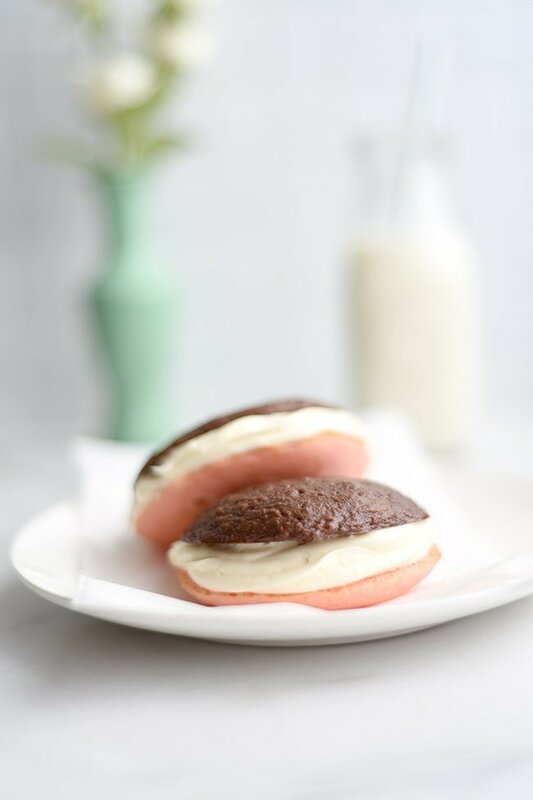 These neapolitan whoopie pies are super delicious and easy to make because I cheat and use cake mix! ???? These tri-colored beauties were inspired by neapolitan ice cream but in a way that doesn’t really have to do with ice cream at all… it has to do with a song by local ukulele player and singer Chris Higbee. Have you heard of him?? Know what song I’m talking about? If you said “Neapolitan Ice Cream” you’re right! If you have no clue what I’m talking about, you can check out Chris Higbee’s song here, on YouTube. The song has a nice wholesome message, sung in true blunt-and-simple country music fashion. And whoopie pies are kind of a Pennsylvania thing. 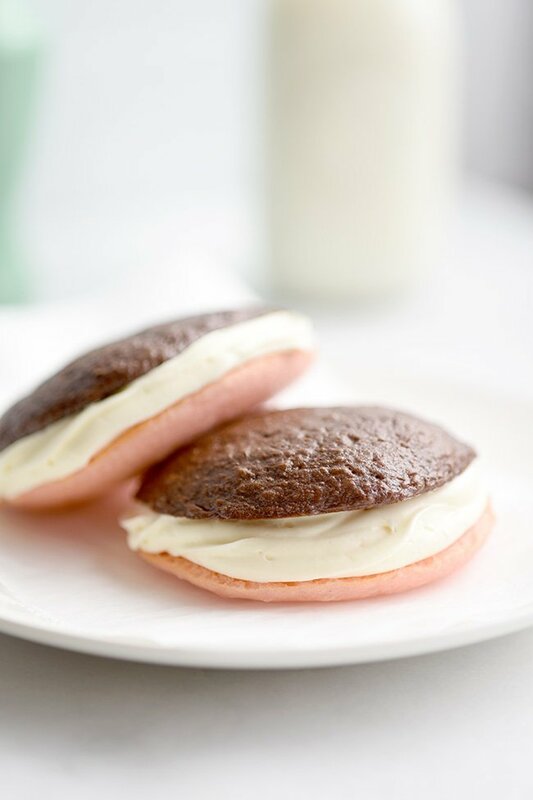 If you’ve never had one, you might be asking what is a whoopie pie? Well, it’s not actually a pie at all. If you break it down they’re just cake in the shape of a cookie with icing in the middle. So almost like a cupcake sandwich. So how in the heck did they even get their name them? Well, the story goes, whoopie pies were made from leftover cake batter and icing. When kids discovered these packed in their lunch boxes the next day, they exclaimed “whoopie!” It’s a cute story and if you’re curious to know more about the history of the whoopie pie, you can read more about it and how Maine and Pennsylvania kind of both take credit for the whoopie pie. Ready to get to the whoopie pie already? A few more things you might want to know and then let’s do this! 1.) If you know me at all by now, then you know I like to simplify everything because who has time to do things that take longer than 30 minutes? Not me! So boxed cake for the win here. I have yet to taste a homemade cake that’s better than a boxed cake mix. Oh, the hate I’m sure to get from real bakers for saying that but it’s TRUE. At least for me. So until I’m proved wrong, I will keep baking with boxed mixes. Baker’s Joy – I am not a spokesperson for this stuff but I should be! I tell everyone about it because it’s a game-changer. It’s basically the spray buter of the baking work. I mean, it is spray butter, but is has flour in it so baked things don’t stick to it. Think Bundt cake, regular cakes, brownies, anything cakey basically. So yeah, get some of this and you’ll thank me later. Silicon baking sheet and pan set – This is annoying but it’s really hard to find silicon pads that actually fit into your baking sheet. So, if you can swing it, this set is ideal. If you deal with a lot of burnt bottoms, then this is what you’re missing. Piping bag and tips set – If you do any amount of baking, you’re going to want a piping bag. It just make icing things so much easier and better looking. Might as well get a big set of tips to start otherwise you’ll be buying the piece-meal and that’s much more expensive.